Let me be clear that I approached this presentation as an ally. Whenever speaking about stories that are not my own I start by acknowledging my own standing. I am a white, able-bodied, cis-male coming from a position of economic advantage. I have many other unnamed and sometimes unrecognized privileges that give me advantage in society. 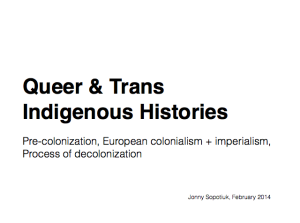 I am a queer settler living on a land with complex cultures and histories that existed long before my distant relatives imposed their belief systems and structures on an entire continent of peoples. I am born to Treaty 1 territory, of English Ukrainian ancestry, and currently live on the unceded Coast Salish territories known today as Vancouver, BC, Canada. I express my solidarity and full support to the IdleNoMore movement. My identity is that of an imperfect ally, I am constantly learning from indigenous, racialized and marginalized communities and my learning will never be complete. I believe that communities should speak for themselves and their own histories. Their voices are more important than mine or that of other allies in our collective struggle for justice and equality. My belief is that the role of an ally is to listen and offer support when requested. In the context of this class I offered to share the knowledge that has been given to me. I have been taught by Elders that I have a duty to share this knowledge and challenge the lies and historical inaccuracies about our shared history that Canadian society continues to perpetuate. I also have a strong belief that our lives and our world would be better off if we all gained an understanding that gender and sexuality wasn’t always so neatly divided into the male/female and gay/straight binaries. 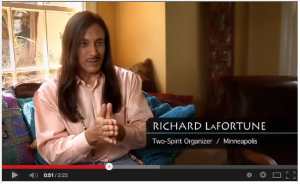 Queer and Trans people have long histories of sacred roles in many societies. Every person and spirit has an equal place around our shared fires. I have uploaded the presentation below. 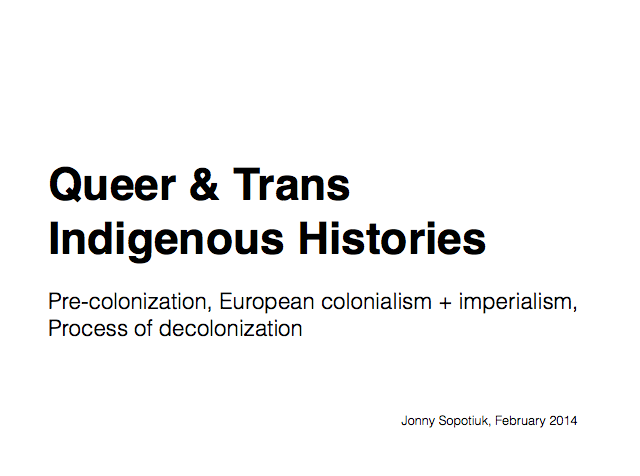 In this presentation I tried to provide historical and current examples of diverse genders and sexuality from cultures around the world. Europe is missing from this presentation given that it was covered in a previous class. Recent histories and current realities cannot be separated from colonial era anti-homosexuality laws that were imposed by Britain and other European imperial powers around the world. It’s also important that when looking at diverse histories we don’t present it as an us and them situation, indigenous and racialized cultures are not stuck in the past, their histories and realities are constantly evolving just as ours are today. Below the presentation is a list of resources and further reading. If you have suggestions, corrections or other resources please leave them in the comments below. S35: Peru: Gender Diverse Cultures Map (http://www.pbs.org/independentlens/two-spirits/map.html).